The tall monolith, moving with a poetic gait, cause of many a silly runouts and executioner of many a great innings in the world of cricket, Inzy Bhai called it quits last night. In the face of great shame (Pakistan ousted out of world cup, beaten by Ireland), and lots of despair (death of Bob Woolmer), he waves goodbye, but the Pakistani team will miss his services and his on-field composure for years to come. 1992 World Cup, where a great captain Imran Khan brought Inzamam’s heroics to the fore, and the world saw him mark his stamp of arrival into the cricketing world (the great innings against New Zealand in Semifinal), 22 year old Inzamam was all about grace, style and ease when it came to batting. I have never been able to figure out how he managed to have so much time to play his shots (especially, with his bulk). His 378 matches, 11000+ runs, 39.72 average and 10 centuries don’t tell you the real magnitude of his impact on the game. Usually the smiling Buddha of Pakistan team, Toronto is the only place where someone saw him loose his temper. Faras Ghani talks about his 5 best innings, while Osman Samiuddin bids him an emotional farewell. But nobody talks about one of the biggest banes of subcontinental cricket – the enormous pressure it puts on all cricketers. Houses are vandalized, effigies burnt, and slogans shouted everytime they lose a match. Why? Because they bring shame to the nation? Those slogan shouters forget that these are the players who put a lot of heart and soul behind those matches. That it hurts them as well when they lose. That when you lose, you want your supporters to rally behind you, urging you to keep the chin up. Inzy has lived through his own set of pressures and boiling moments. And has come out calmer all the way. And if he seems soft, lets remind the cricket world about the walk-off Pakistan team did under his captaincy at the Oval. It takes a lot of courage to take such decisions. 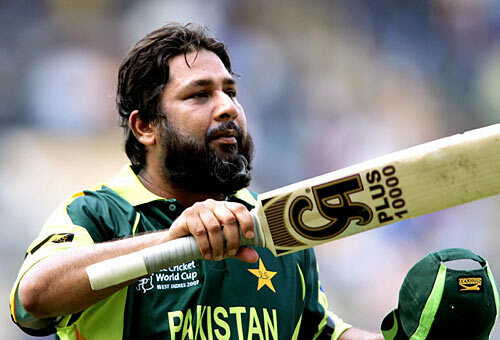 So Long Inzy Bhai The generation of cricketers to come would not forget that batting might be science, but it’s the artful craft of players like Inzamam-Ul-Haq that makes cricket such a delight to watch. We will not forget those effortless sixes, delicate late cuts, fearsome pulls and elegant drives. 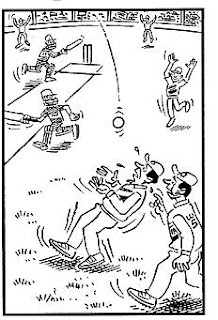 It takes a lot from refraining from commenting on the World Cup and the Indian Cricket Team. and I have done that a bit here with my previous post on cricket being about the fight between Gavs and Ponting. That fight took multiple dimensions with the entire Aussie team trying to defend their on-field behavior by not referring to it even once, but talking about how Gavs should not have brought Hooksie in this discussion! Well, hmm.. hmph! But thats not what this post is all about. This post is about India, the WC and the Indian team..
1. We lost to Bangladesh. Greatbong rips our performance apart here. My biggest grievance. If you have a wound, you treat it. If you don’t, it becomes gangrene. After a while, you need to remove that rotten part of your body because the infection starts spreading to other parts of the body. At one point in time, the Indian team (even though it was administered a little brutally) did this to good effect by letting Ganguly go. The left and the deft hand of Indian cricket for a good time, Ganguly, did come back with a vengeance. Sehwag’s situation is worse. Its affecting the whole team. The recklessness that is considered the bane of all sports became style. Sehwag was joined by Dhoni. And now it seems to be the flavor of the season! 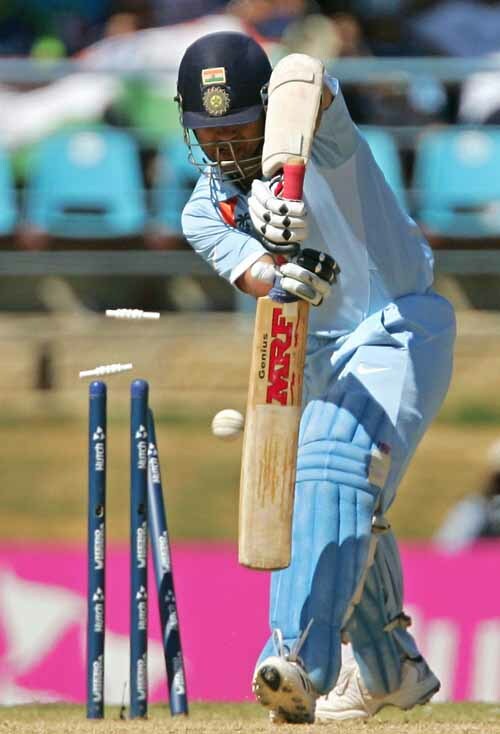 Even the perspiring Dada [who is not ready to get off the wicket in this stint of his career, even if it means scoring once in 6 balls (the last deliver, to be precise)] played a reckless shot at 67 (and later on, against Bermuda). Bowling was petty at best, and streetside on an average. 2. We thrashed Bermuda. I should be happy, right? Am I? not quite! 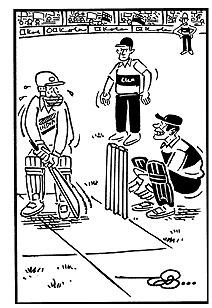 After reducing them to 50-odd runs for 5, we still let them score 150 odd runs. That tells me that the body language is still not one for the kill. 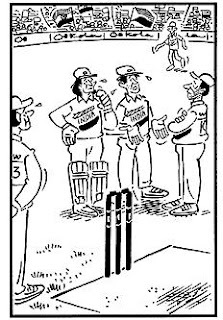 The batsmen were having fun making records, and that explained the 400+ score. Bowlers, too comfortable after getting the top 5, started reveling in that glory! Dada was still perspiring. 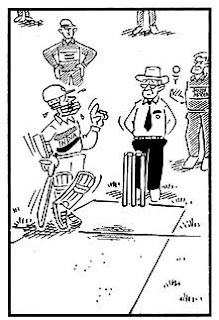 Two back to back half centuries against (presumably) below average bowling attacks would air a picture of a dada dancing down the crease to clear the stands far too many times. I would have wanted to imagine a dada slashing through the gully region and driving through the covers. Not this time. It was a hard toiled effort. But still, hats off to him for perspiring. 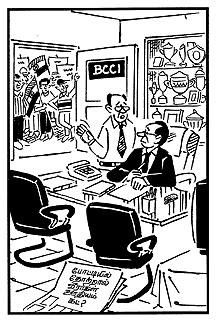 Some of the media folks have started reading too much into the comeback of Viru! 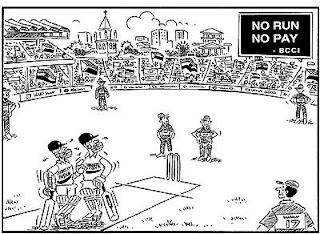 But Mumbai Mirror has got it spot on– back all swell, against Popatwadi XI. Those who saw the match yesterday would recall the umpteen hit n miss shots played by Viru. The number of times he did not get out was more than the times he would get a chance from any other team. Yuvraj still seems to be the best bet. Zaheer remains the pick of the bowlers, ready to bend his back, slog it out.